Seriously, what is their problem? Just because some guy says 12 are dead – doesn’t mean you post it. Even Rupert Murdoch should know that (maybe not). Let’s do this! i’d like to cover the Nashville/Clarksville TN region. What needs to be my next step? Is this a real post? No one as smart as Jill Kennedy actually believes The NY Post is a real newspaper. New Yorkers don’t, that’s for sure. The Post gives papers like the Enquirer and the Star a bad name. You’re right, prancerberg, I don’t actually think the Post is a real paper. I just wanted to point out, again, how dumb they really are. Wow, a lady that actually will come out and say the truth in NYC. Intellegence and honesty beyond beauty. LOL! The Manka Bros website (as its so-called divisions) continue to prove that there’s “a sucker born every minute”–and many of them, as expected, reside right here on Linked-In. If the story wasn’t so grim, this is perfect for Leno’s bit about STUPID STUFF that gets printed as news. 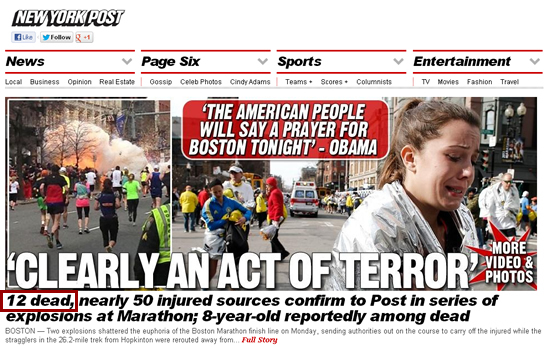 And as for Manka…do we actually buy into The Huffington Post as a source of anything either?